There are many things I love about Postcrossing: the serendipity of unexpected postcards from around the world showing up in my mailbox, the fairness of receiving exactly the number of postcards that I send... but I also love the incredible variety of foreign postage stamps it brings me. I'm not really a stamp collector, per se, but I am certainly an aficionado, and I appreciate a fine stamp as much as anyone. So I was extremely excited to receive this beautiful stamp of Wolfgang Amadeus Mozart, from the Czech Republic, issued in 2011. I find the design especially beautiful - not just a simple portrait or profile, but instead an active image of this vibrant personality in motion, conducting, superimposed over an image of the original score to Don Giovanni. It even illustrates what a clothing dandy Mozart was, with the fine frock and lacy cuffs. This one is a keeper! For more information on the stamp, check out this fine blog post about Czech stamps. I was looking at your tweets and saw the one where you RT someone saying that "queer characters [in books] were important". I just read a really great book that speaks volumes to me and should to anyone who's not the American average standard. It's called "The Little Giant of Aberdeen County". So good! The heroine is a very large woman, the man of her dreams is small and there is a gay/transsexual character in the book who is celebrated for being himself. I loved it! If you read it, you should let me know! Hi Jessica - Thanks so much for letting us know! 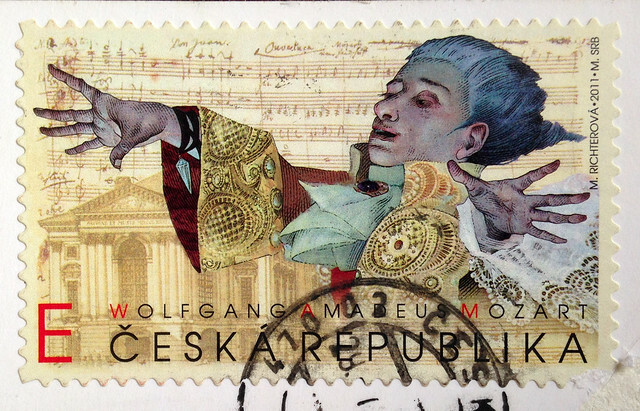 Hi, I received this same Mozart stamp on a postcard also. The Postcrosser said it was her last one of this stamp. They are absolutely beautiful. On Ebay I found a sheet of 6 mint for almost $12 plus $3 shipping. I am still looking for a less expensive seller. Your postcards are always a hit with the recipients BTW. what an unusually dynamic stamp! a bit dandy and eerie! the stamps are probably my favorite part of postcrossing, even more than the cards themselves! I agree, Allison - I often enjoy the stamps even more than the Postcrossing postcards!